Before we get to the message of this meme, which may be different from Morgan Freeman’s intended message – let’s figure out if it’s bona fide. More or less so: Although 60 Minutes interviewer Mike Wallace asked the question “How do we stop racism?”, Morgan Freeman supplied the rest of the statement in a 2005 interview. The quoted comments come immediately after Mr Freeman’s explanation for why he would like to see Black History Month done away with. Does Mr Freeman really want everybody to stop talking about racial issues? Blogger Zak Keith believes that Mr Freeman’s quote is being intentionally misrepresented – boiled down into a sound bite that bears little similarity to the intended message. Mr Keith’s analysis starts out promisingly enough, but in the very next paragraph he plunges headfirst into breathtaking inanity by saying that – brace yourself for this – black Americans live in a world where they are no longer marginalized and in which anti-black racism has been solved to the extent that they feel comfortable ignoring it. I’m not even close to kidding. He actually said that. Mr Keith, who is – with all apologies to Mr Freeman – an Asian American, believes that Asians living in the West have not yet achieved the post-racial benefit of being able to ignore racism. I agree that Asian Americans are still victim to racism, but come on, Mr Keith: the people who claim that racism is mostly solved, at least as far as black Americans are concerned, are the very reason we must continue to have this discussion. The resurfacing of the Freeman quote is no doubt in response to President Obama’s recent call for the nation to hold a discussion on race and racism. 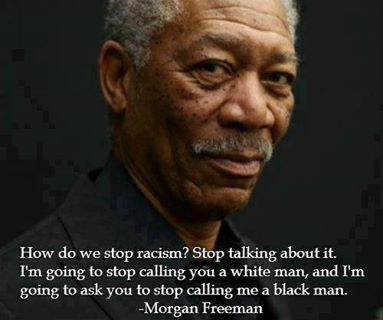 Even if the quote was originally embraced by black Americans (as Mr Keith suggests), this time it’s finding its way onto the Facebook walls of white conservatives, who probably think that if Morgan Freeman wants everybody to stop talking about racism – well, what can you do? He’s played the President and God! You can’t argue with that kind of authority. And he’s black – again, apologies to Mr Freeman – so if a black man doesn’t want us to talk about racism, then we’re well on our way to being done with it, right? Right? Like Mr Freeman, I wish for a world in which people are not defined by race, but racism will not evaporate if we simply refuse to talk about it. Right now, there’s a problem. If we’ve learned nothing else from our history as a civilized species, we should have learned that you cannot solve a problem by ignoring it. This entry was tagged race relations, racism. Bookmark the permalink.